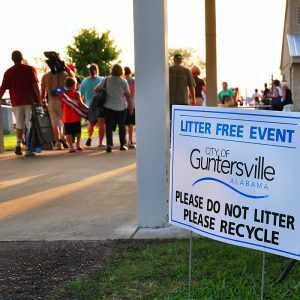 Curbside Recycling is provided to all residents of the City of Guntersville. Residents may pick up blue bags free of charge from the following locations: City Hall, the Water Board, the Recreation Center and the Library. The Guntersville Recycling Center gladly accepts recyclable items from individuals living outside of the city limits. Recyclable items are accepted at the Recycling Center located at 3450 Wyeth Mountain Road. Items should be placed in the bin in front of the center. Recyclables are collected on Mondays and Tuesdays. For more information call (256) 571-7598. PAPER– newspaper, office paper (all colors), shredded office paper, magazines, hardback books, paperback books, phone books, catalogs, junk mail, cardboard (includes all types of storage moving boxes, cereal and other dry good boxes from the grocery store, paper towel and bathroom tissue rolls, oatmeal boxes, and wrapping paper rolls). GLASS-clear/brown/green. Only food or beverage glass is accepted. Please separate the glass by color and tie in an old grocery sack before dropping into the blue bag to reduce the possibility of injury to yourself or our crew members. PLASTICS-#1-#2 (most food containers, bottles and jugs: beverage bottles, laundry detergent jugs, milk and orange juice jugs, and shampoo bottles). Please remove plastic lids from bottles. Styrofoam or bottles containing hazardous chemicals such as gas, antifreeze, or pesticides WILL NOT accepted. ELECTRONIC WASTE-There will be a fee charged for most electronic waste. For more information about fees or to curbside pickup appointments within the city limits, please call (256) 571-7598. ATTENTION: Business Owners and Office Mangers – appointments may be scheduled to pick up large quantities of shredded paper/office paper. Please call (256) 571-7598 to schedule.